If you have any comments or would like more information please fill in the form below or give us a call. Our office hours are 9am to 4pm Monday to Thursday and 9am to 3pm on Fridays. If you’re enquiring about prices, deliveries and minimum order quantities you can check out our shop. Here you’ll see all our firewood products, price variations and minimum order quantities to your area. If you live outside our usual delivery areas please get in touch and we’ll see if we can help you. Need to speak to us? Our office hours are 9am to 4pm Monday to Thursday and 9am to 3pm on Fridays. The Log People live at Maes Y Clawdd, Oswestry, SY10 8NN. We’re just down a wide open drive directly opposite Jewson (the builders’ merchant) and in front of Cold Move. If you’re struggling to find us just call 01691 887977 and we’ll guide you in. 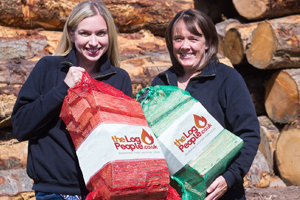 Customers are welcome to buy and collect logs from this address. All customers who collect logs from our sawmill automatically benefit from the lowest possible prices. See our collected log prices and find out how much you can save by collecting logs yourself. Our office hours are 9am to 4pm Monday to Thursday and 9am to 3pm on Fridays.